Nestled in the rolling hills of the hinterland this holiday house is an idyllic country retreat. Set in six acres of gorgeous countryside this Byron Bay holiday house has spectacular views over the hinterland. The Tuscan style converted Barn is fully self contained, with open plan living and a mezzanine loft bedroom. There is plenty of indoor and outdoor space for children to enjoy, along with the use of a swimming pool and artificial beach. 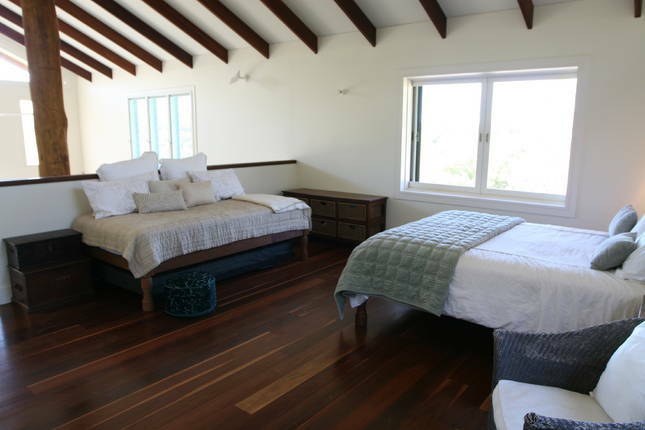 Relax and unwind in the complete tranquility of this fabulous Byron Bay retreat. Byron Boutique Barn is located at Myocum, a 15 minute drive to Byron Bay and 20 minutes to Bangalow. The Barn is also pet friendly. 1 Bedroom. 1 Bathroom. Sleeps 3. During specific weeks the 3 bedroom house is available to rent along with the Boutique Barn - perfect to up to 9 guests. The main Hamptons inspired house enjoys spectacular views and can accommodate up to 6 guests in 3 bedrooms and a family friendly living and kitchen space spilling out to the large covered deck with barbecue. Surrounding Byron Bay is the lush sub tropical rainforest and breathtaking beauty of the hinterland where you can escape the hustle and bustle of Byron, and relax under the clear night sky. It is only a short drive to the pristine Byron beaches, township and local hamlet villages. The hinterland offers a truly unique and relaxing holiday experience. Byron Boutique Barn is 15 minutes drive to Byron centre and beaches.